Take any of the ITIL Intermediate exams directly from your computer quickly and easily. Passing results and a digitally signed certificate will be presented immediately following the exam. You will also be mailed a printed certificate. Students will be required to show proof they have acquired the ITIL Foundation certificate prior to scheduling their ITIL Intermediate exam. Once you register, your confirmation email will include instructions on how to submit proof of your ITIL Foundation certificate electronically. In addition, students will need to show proof they have completed the ITIL Intermediate course related to the specific exam they are registered for. Once you register, your confirmation email will include instructions on how to submit proof electronically. 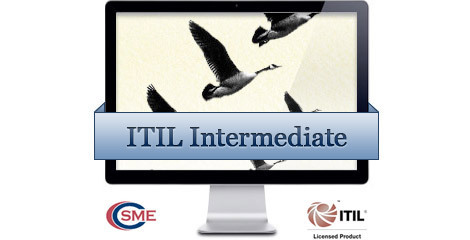 Looking for an accredited ITIL Intermediate course? As an ITIL Accredited Training Organization (ATO), the Foundation exams offered through ITIL Prime are authorized and proctored by PEOPLECERT. PEOPLECERT (Certification Subject Matter Experts) is an official ITIL certification body that has operated in accordance with ITIL examination Instutite (EI) standards for more than 10 years. The ITIL Foundation exam is offered in the languages listed below. Following registration, the exam taker will identify the appropriate language for their exam. Language availability follows official OGC Foundation Exam Language Availability guidelines. Official ITIL Intermediate exam voucher - Valid for online proctored exam. Online exam requires free-standing webcam. Requires proof that student has completed an accredited course and has attained ITIL Foundation certificate. Following purchase, you will receive an email with instructions on how to provide proof electronically. * Please note that exam vouchers are valid for twelve (12) months from the date of purchase. Official ITIL Intermediate exam voucher - Valid for online proctored exam. Online exam requires free-standing webcam. Requires proof that student has completed an accredited course, has attained ITIL Foundation certificate, and has earned a minimum of 17 ITIL Credits. Following purchase, you will receive an email with instructions on how to provide proof electronically. * Please note that exam vouchers are valid for twelve (12) months from the date of purchase. If you plan to take the real ITIL certification exam from your personal computer, a webcam is required. Any type of working webcam is acceptable. This includes integrated webcams, and free standing webcams. ITIL® is a registered trade mark of AXELOS Limited, used under permission of AXELOS Limited. All rights reserved. RESILIA™ is a trade mark of AXELOS Ltd, used under permission of AXELOS Limited. All rights reserved. All ITIL® and RESILIA™ courses are offered by CareerAcademy.com AFFILIATE of AXELOS Limited. ITIL Prime is owned and operated by SSI Logic. Copyright © 2019, All rights reserved.